Mold testing procedures were not developed to determine whether a home is “safe” or “healthy” or “clean." Although this article is titled "Mold Testing" it actually tells you why testing for mold is usually not needed. For more information, see Popular Topics/Homeowner Resources. There are no numerical standards to which tests can be compared making interpretation difficult. Even extensive, well made tests cannot determine how much exposure people had in the past. Fungal air tests are expensive to make. Any money spent on mold testing will not be available for cleaning up the mold and fixing the water problem that led to the mold. It may be days, often weeks before the results of testing are known. Protection Agency (EPA) recommend measuring airborne fungal levels. The likelihood that airborne samples will provide information that careful inspection does not is very small. Airborne sampling should be limited to instances where people are experiencing symptoms that seem to be mold related, but no mold is found by inspection. What you do need to know is the size of the areas that are contaminated and where the areas are located so you can plan the clean-up and protect people from exposure during the clean-up. The greater the area that has mold, the more careful you have to be in how it is cleaned up. Both the NYC Department of Health and the EPA mold remediation guidance are based on the extent of the visible mold growth. Determining the amount of surface area of moldy surfaces is done by looking. Since mold problems are caused by water problems, looking carefully where water is likely to be or where water likely had been is the best approach to looking for mold. It is easier to “find” the water problem by looking for water than it is to find the water problem by testing for mold. substitute for inspection. However, inspection can often be a substitute for testing. Mold testing procedures were not developed to determine whether a home is “safe” or “healthy” or “clean”. Presently no standards exist to determine “safe”, “healthy” or “clean”. Indoor mold testing procedures were developed to identify the locations where mold is growing or where it has grown – the mold “reservoir” locations or mold “amplification” sites. Part of the problem is that no one knows what typical conditions are for homes, offices and schools – there is no “baseline” for comparison. Research is going on to answer this question. One day we will know, but we don’t know now and it will be many years before we know the answer to this question. The other part of the problem is that there is no “doseresponse” curve for mold and humans. We just don’t know how much exposure to which molds and for how long leads to problems. It’s even more difficult when you realize that no two people are alike. Research is also going on to answer this question and one day we will also have the answer to this question. This question is far more difficult than the previous question and it will likely take much longer to answer. Common sense tells us that “too much” mold for “too long” is a problem for most people. Prudent avoidance is the best course of action at present. Mold testing is not necessary to quantify “too much”. Too much mold in a home is obvious. If you see mold and you smell mold – you have mold – and if you see it and you smell it you probably have too much of it. Remember, mold needs water. No water, no mold. In fact it is more basic than that. No water problem, no mold problem. Find the water problem and you will find the mold. If a home has mold and the water problem that led to mold is obvious it is pointless to test for mold. The mold testing will not tell you anything that you don’t already know you have to do which is to clean up the mold and fix the water problem that led to the mold. Mold testing is expensive. Any money spent on mold testing will not be available for cleaning up the mold and fixing the water problem that led to the mold. Also, the samples can take days or weeks to be analyzed – time that is lost that could better be spent cleaning up the mold and fixing the water problem. No recognized authoritative public agency recommends mold testing to guide the clean-up or to direct correction of the water problem. 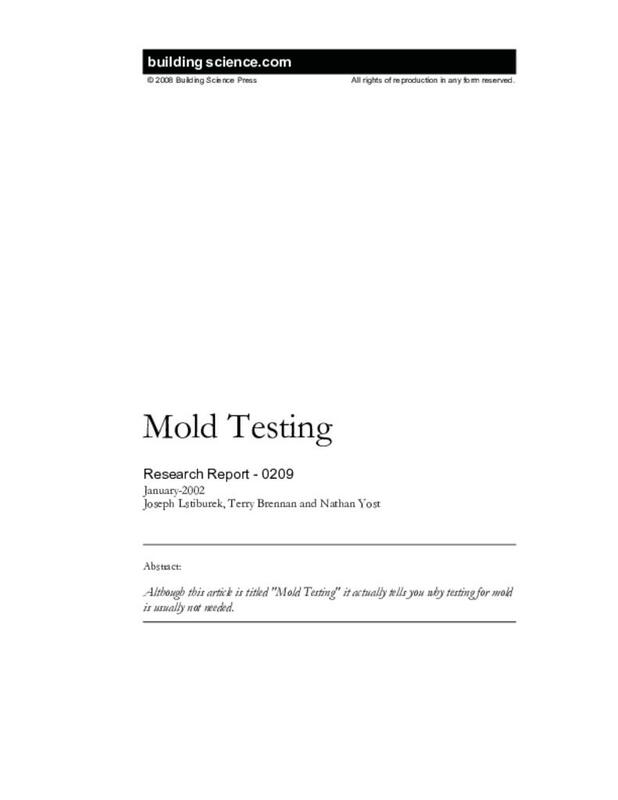 Mold testing – especially air testing - is often inaccurate. Air samples at best give a “snapshot” of the air in one location at one time – air samples are not representative of air conditions over time unless many air samples are taken over a long period of time. Air sampling typically overestimates or underestimates the amount of mold in the air on average throughout the day. How Do I Look For Moisture and Mold? behind or beneath cabinets, furniture, shelving, appliances fixtures, storage containers; under sinks, cabinets, cardboard boxes, toilets; on walls behind headboards, bookcases, sofas, dressers, file cabinets or toilets. There are a number of ways to try to figure our whether mold is growing in any of these locations. Inspection is the most direct method and has the most useful return on effort. Move the furniture; look under boxes, behind toilets and inside closets. Examine vinyl wallpaper for lumps and bumps and pink or purple bleed-through spots. Moisture meters can help determine whether a material is wet, even when it appears dry and can therefore help locate a moisture source or reservoir; the moisture meter provides immediate results. Several fiberoptic instruments (boroscopes and endoscopes) permit looking inside cavities through a small hole. However, this method is not as reliable as opening up the cavity and looking directly. If you are going to cut open a wall, be careful. In the process you could release a large amount of mold into the air. At a minimum have a good vacuum to collect the dust and protect yourself from exposure with a dust mask (N95 mask available at most home improvement stores). How Do I Know How to Clean Up If I Don't Test? How to clean up the mold should be based on how much mold is present. The more mold present, the more careful you have to be in how it is cleaned up. The amount of mold present is best determined by how much surface area is covered with mold. Mold remediation guidelines developed by the EPA and others are based on this principle. The number of square feet of mold present on moldy surfaces determines the approach to the clean up. Determining the amount of surface area of moldy surfaces is not done by mold testing. It is done by looking. It is done by looking everywhere. In order to do this it is often necessary to cut holes in walls, ceilings and floors to see. Since mold problems are caused by water problems looking carefully where water is likely to be or where water likely has been is the best approach to look for mold. Biological measurements sometimes provide useful information in finding hidden mold when thorough inspection has not found moisture or mold. Large variations over hours, days, seasons require numerous samples, systematically made to be certain that the sample are representative. (Variations are the result of intermittent spore release and the dynamics of air transport). There is a difference between total spore counts and viable spore counts. Total spore counts are more representative of allergen load than viable spore counts. Viable spore counts represent a fractional subset of the total spore count and may grossly underestimate the total amount of mold in the air. Viable spore counts can provide some information that total spore counts cannot. Only viable spore counts permit speciation, the identification of fungi to the species level. This may be useful in trying to distinguish whether air borne spore counts reflect an outdoor or indoor source. Samples that show no evidence of indoor growth can be false negatives. “No growth” cannot be used to conclude that there is not an indoor source of mold. Because of these uncertainties many samples should be taken to increase the probability of obtaining useful information. The likelihood that airborne samples will provide evidence that inspection does not is very small. Reserve air sampling for mystery cases, where things smell moldy or people complain of symptoms that are consistent with mold exposure, but no mold is found upon inspection. What if the Insurance Company or a Lawyer Really Wants Mold Testing? If it is important for someone to make an estimate (educated guess) of the fungal exposures people have received, then you need to contact someone who has extensive experience in mold investigations. The “educated guess” may or may not involve airborne testing since airborne testing was not developed to assess exposure. And remember, it is only an educated guess. How Do I Know If the Mold is Cleaned Up If I Don't Test? The mantra for clean-up is “clean and dry.” If you don’t see it or smell it on a surface you probably don’t have it. And if you do have some, even though you don’t see it or smell it – you certainly don’t have much of it. A little bit of residual mold is not a problem unless moisture is available. Remember, mold is everywhere. Even if the clean-up removes 100 percent of the mold, spores that are in the air will reintroduce mold back into the cleaned area. The “white glove test” and common sense are currently the best approach. No dust and dirt – no mold. Clean everything for dust and dirt and everything will be clean of mold. All surfaces must be free of debris, dust and dirt. There may be residual mold left in the building that is unseen, but this is acceptable. The object is not to sanitize or sterilize the building. The object is to avoid exposing people to large amounts of mold. Bear in mind that many of the molds that colonize buildings are common in the outdoor air where spore levels may be very high (often having counts of hundreds of cfu/cubic meter, periodically thousands and occasionally tens of thousands). Even if the clean-up does remove 100 per cent of the mold, outdoor air will quickly reintroduce mold spores into the cleaned area. This is why the underlying moisture problem must be corrected to prevent the recurrence of mold. This brings us to the second part of the clean-up mantra- dry, dry, dry. A little bit of mold is not a problem. A little bit of residual moisture may be a problem. Materials that have been salvaged must be dry before reconstruction begins. Wooden materials should be less than 15 per cent moisture content by weight and concrete should be less than 4 percent moisture by weight.